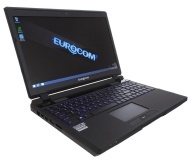 alaTest has collected and analyzed 2 reviews of Eurocom X3. The average rating for this product is 3.9/5, compared to an average rating of 4.1/5 for other products in the same category for all reviews. Comments about the size and keyboard are overall positive. The durability and price are also appreciated. The touchpad and sound get critical comments. Views about the screen and usability are different. We analyzed user and expert ratings, product age and more factors. Compared to other products in the same category the Eurocom X3 is awarded an overall alaScore™ of 83/100 = Very good quality. The Eurocom X3 is a midrange gaming laptop that boasts some killer hardware, but it's held back by some small, but significant, flaws. Solid performance from Intel Core i7 quad-core processor and latest Nvidia GPU. Lots of storage space. Speedy booting and performance with SSD boot drive. Keyboard features multicolor backlight. Built in subwoofer. Dual-Layer DVD+/-RW optical drive. Overly bright screen skews colors. Touchpad lacks Windows 8 gesture support. Easily one of the fastest notebooks with a single SSD and discrete GPU we have tested.